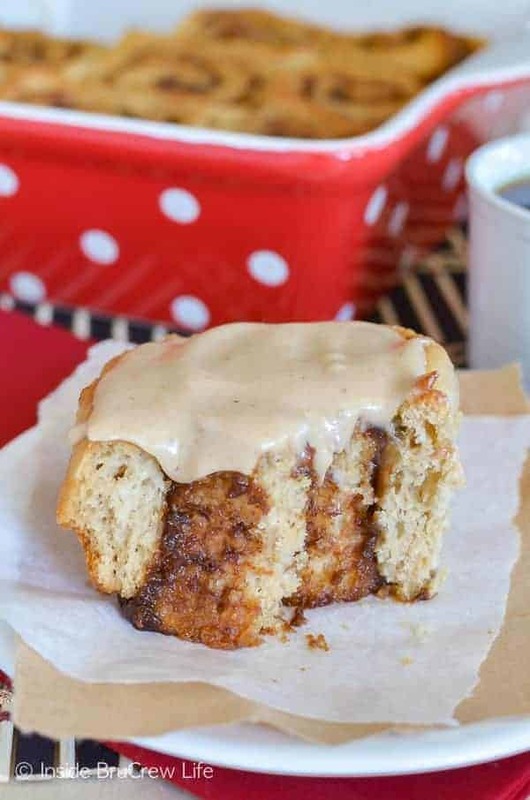 A pan of these easy Apple Butter Cinnamon Rolls makes a great breakfast or afternoon snack. It’s like having a warm bite of fall on a plate. 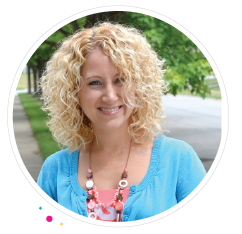 *I am partnering with Musselman’s this fall. As always, all thoughts and opinions are 100% my own. It’s supposed to be fall here. Remember how I talked about how excited I was for the chilly weather, the changing leaves, and wearing sweatshirts? The weather is not cooperating with my desire to be cold and have a cozy sweatshirt on. There were a few days this week when we had the windows open all night long and the house was chilly in the morning, so I got a little too excited and pulled out the sweatshirts. Both days when I was sitting in the pick up line for school…in the 80* heat…I was seriously regretting my clothing choice. Never mind that I did that two days in a row. I finally got smart to the fact that we are in the middle of a heat wave, and I wore a t-shirt to our son’s soccer game yesterday. An hour and a half of sitting in the sun with a sweatshirt would have definitely distracted me from the game. Until our weather decides to cooperate with the calendar, I will just dream of all things fall. I have fall candles burning in my house, pumpkin decorations in my living room, Apple Butter Cinnamon Rolls in my oven, and the air conditioner cranked to a nice chilly 72 degrees. Take that summer. I can beat you at this game. 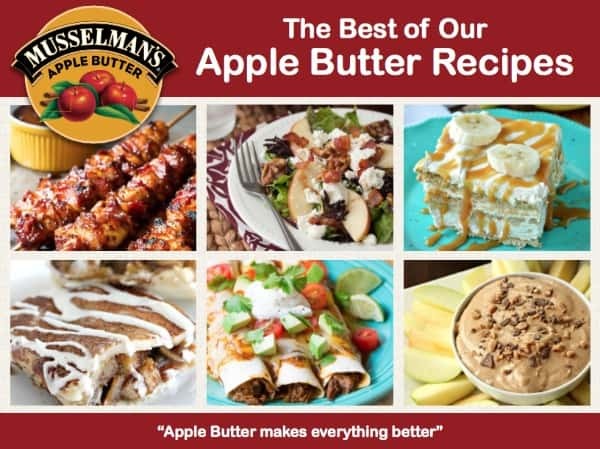 This fall Musselman’s contacted me again to create an apple butter spin on a classic recipe. I remember growing up eating apple butter on toast when I was little. Warm bread coated in melted butter and spicy apple butter is definitely a breakfast to get excited about. I just can’t get enough of that stuff! Apple butter is applesauce that has been slowly cooked down into a caramelized thick spread. The smell while it is cooking is absolutely amazing. It will fill your house with a spicy apple orchard kind of a feeling. I do love to eat apple butter and toast, but I also love to bake with it. Last year I made this Apple Butter Cake that I am thinking needs to happen again with my leftover jar of apple butter. 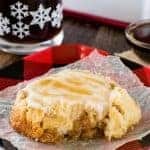 When I was trying to decide on what sweet treat I wanted to share with you that was full of apple butter taste, I kept thinking about the classic cinnamon roll. I decided to use my recipe for these Mocha Chip Cinnamon Rolls and change it up with apple butter. These easy cinnamon rolls can be made, rolled, and baked in about 40 minutes. That’s what I like to hear when I am craving homemade cinnamon rolls. I cut back on the butter milk in the recipe and substituted apple butter. I wanted these rolls to have apple butter shining through in every element. Pat the dough out on your counter or table. Now the dough is going to be sticky, but don’t worry. Keep a layer of flour between the dough and your work space. Go ahead and knead the dough with some flour just to make it workable. Pat the dough out with your hands to form a 10×14 rectangle, trying to keep it as even as possible all over. Time to add some more apple butter. Spread a layer of apple butter over the dough, making sure not to go all the way to the edges. Sprinkle that with a little bit of sugar and cinnamon. Usually I use more for my filling, but I knew that I didn’t want to overwhelm the apple butter. Start to roll up the dough from the shortest side. It will stick to your counter, so use a butter knife to gently loosen it as you go. Cut the roll into 9 even pieces and place them in a pan that has a thin layer of melted butter in the bottom. 20 minutes in the oven and these rolls will be a nice golden brown. Pull the pan out to cool slightly while you make the apple butter glaze. I told you I wanted these rolls to be full of apple butter goodness. I would say I accomplished that by having apple butter in all three elements of these cinnamon rolls. Who else is ready for chilly weather and apple butter on everything? 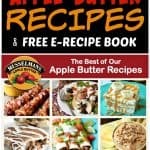 Download the free Musselman’s E-Recipe Book here. 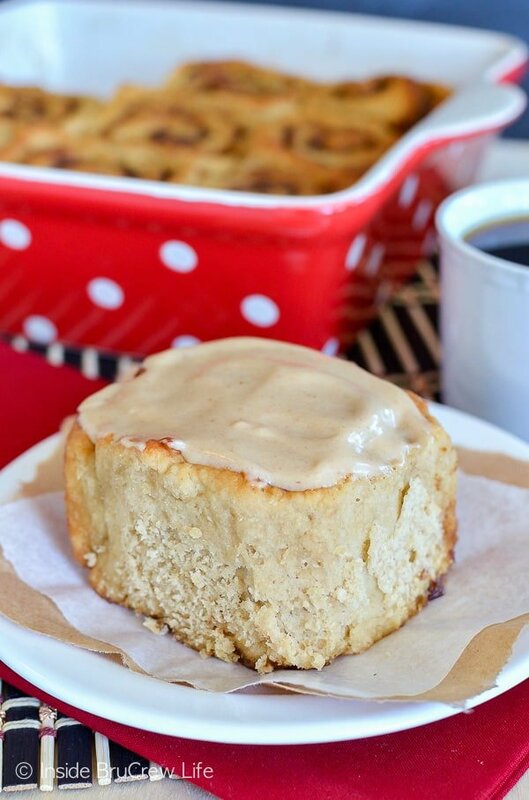 These soft Apple Butter Cinnamon Rolls are a delicious and sweet breakfast for fall mornings. Sift together the flour, sugar, baking powder, baking soda, and salt. Create a well in the center and pour in the buttermilk, apple butter, and 4 Tablespoons melted butter. Slowly beat on low with a mixer until a soft dough forms. You can also use a fork. Place the dough ball on a floured surface and knead a few times to make the dough more manageable. The dough is very sticky. Pat out the dough to form a 10x14 rectangle, making sure to keep flour underneath and to keep it evenly patted out. Spread the apple butter over the dough, making sure to not go all the way to the edges. Mix together the brown sugar, sugar, and cinnamon and sprinkle over the apple butter. Gently and slowly start to roll up from the shortest side. The dough may stick to your work surface, so use a butter knife to gently loosen the dough as you roll. Cut a very small piece of each end to even it up. Cut the dough roll into 9 even pieces. Place the rolls cut side down into an 10x10 pan that has been coated with 1 Tablespoon melted butter. Bake for 20 minutes. Remove from the oven. Beat together the cream cheese, powdered sugar, and apple butter until creamy. Spread over the slightly cooled rolls. Serve immediately. Keep uneaten rolls refrigerated. Can be warmed in the microwave for 30-40 seconds to eat the next day. 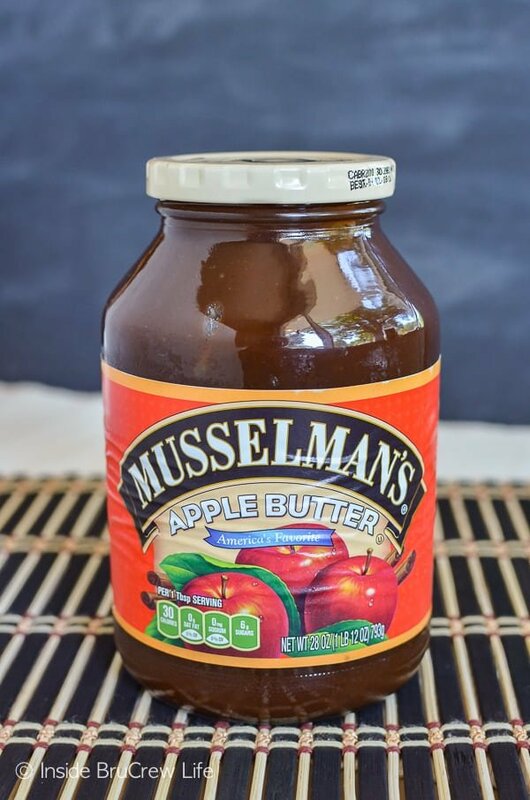 *BruCrew Life was sent a jar of apple butter and compensated to develop a recipe for Musselman’s. All opinions in this post are 100% my own. Yum! 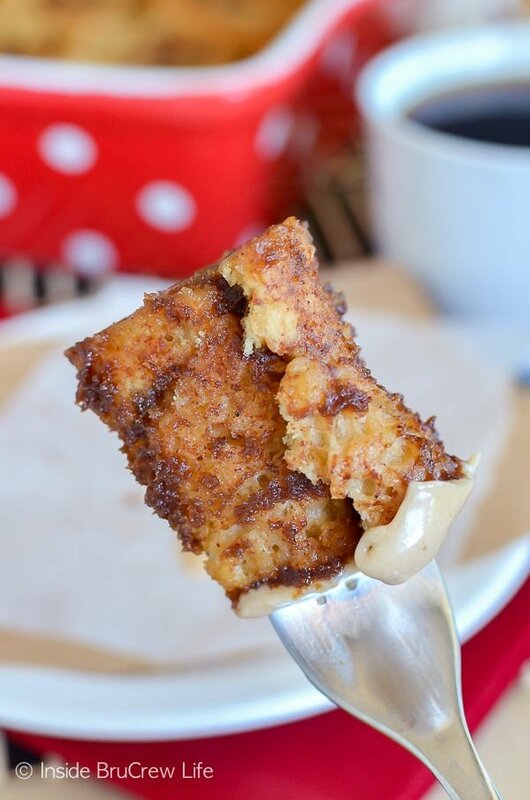 What a delicious spin on both apple butter and cinnamon rolls. 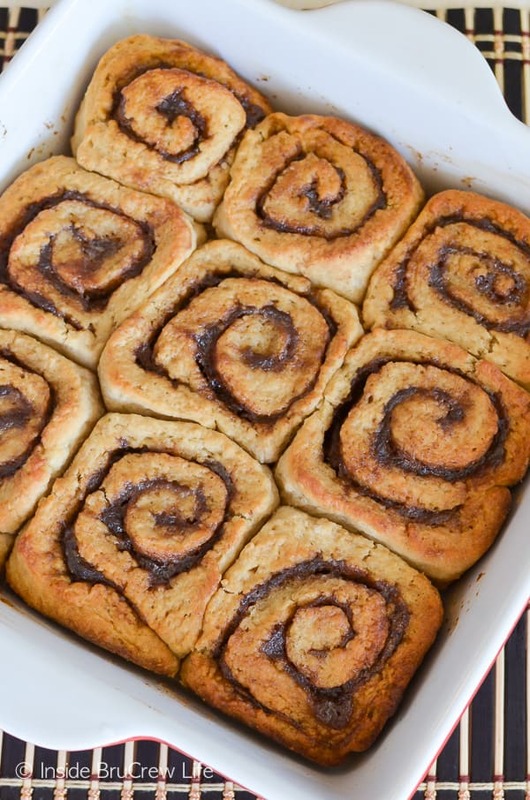 I recently posted cinnamon rolls with pumpkin butter… great minds think alike? 😉 Have a great weekend, Jocelyn! Yes, they do!! 😉 Thanks Erin!! We had 80 degree weather, too … so disappointing when you are wearing a sweatshirt. Oh, well, soon it will be cool and breezy, right? And then I can eat these cinnamon rolls without the AC, right? 🙂 They look delicious (I have no self control with cinnamon rolls) and all these apple butter recipes are going to force me to buy apple butter … it sounds like fall in a jar! I hope so! I will be hugely disappointed if we go straight from hot to cold! Thanks Mary!! oh I love cinnamon rolls!!! 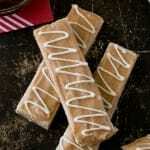 These with the apple butter look amazing! Thank you so much Chandra!! Oh my goodness, this is just too much!!! These look soooo yummy!!!! I covet your polka dot pan! These are my kind of rolls … cinnamon, apple and no yeast 😉 I was so excited about cooler weather, but today the Santa Ana winds start … it will be a lovely 93 degrees today and tomorrow … yuck! Haha, thank you Brenda!! Yuck to that hot weather!! I cannot even believe these right now. I’ve seen like every combination of apple + cinnamon rolls, but not apple butter! I need these in my life! That’s what I like to hear!! 😉 Thank you Beth!! I am beyond impressed that these are no-yeast rolls and ready so fast! WOW! and I love apple butter and these look stunningly good! I love apple butter. I never thought to add it to cinnamon rolls. They look delicious! Our weather has been kind of funky too but I *think* it’s going to finally cool off for good now. We’ll see though because sometimes October is still weird here. And boy do I want one of these! 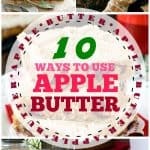 Brilliant idea to use apple butter. Crazy weather anyways!! 😉 Thank you Rachel!! Saved the recipe. Pinned a picture. Would like to subtitle my “Desserts” board: “why I will never by skinny again”! :p Abble butter should have it’s own food category. Haha!! Yes it should! Thanks LuAnn!! Cinnamon rolls just scream fall to me in the first place, love that you used apple butter to give it an extra fall kick! Definitely need to try these, yummy! This weather is crazy! It’s been in the 80’s in NYC. I feel like I should be enjoying it, but all I really want is to wear scarves, sweaters and boots. It might not feel like fall, but I plan to keep eating like it is. The rolls are perfect for the weekend! Haha, I know!! Thank you Kelli! Yes Jocelyn! These are going to be my favorite cinnamon rolls! So super quick and no yeast?!? Sign me up! Plus, I love apple butter! 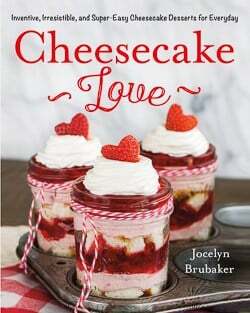 These look crazy good, Jocelyn! Perfect way to start the weekend! I absolutely LOVE musselman’s. I just used it in a savory dish but I loved how you used it in these cinnamon rolls. Pinned! Oh my gosh, I can’t believe how beautiful these look! I want to stuff one of those into my mouth right now! And I hear you on the weather…we’re FINALLY getting some cooler temps in the morning, but it’s still nearly 90 in the afternoons. Where’s fall??? Thank you Ashley!! Yes, where is my lovely Fall?? Haha! I totally agree!! 😉 Thank you Jess!! I have some of that very same apple butter in my fridge right now … my kids love it …. & these do look really good …. but I am DROOLING over that dish!!!! POLKA DOTS!!!! I love it, where ever did you get it???? 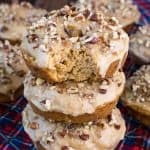 I’ve never had apple-y cinnamon rolls, but these sound perfect, Jocelyn! And I love that they can be made so quickly. 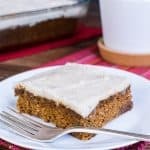 Maybe if we all keep baking with pumpkin and apples, fall will eventually decide to stick around (it’s still hot here, too)! Could these be made a day ahead and refrigerated? I’m thinking they would be perfect for Christmas morning…I can just imagine how good the house would smell as we’re opening presents! Yes, these are still great the next day. I actually always make them a day ahead because I’m not really a morning person. Just pop each one in the microwave for about 10-15 seconds and they are perfect! I love apple butter – literally it is my thing. I have the best memories of homemade apple butter from my grandpa! I can’t wait to try his recipe with these rolls. Pinned! SU! No, the recipe is correct. I only add 2 1/2 cups of flour to the dough. I did mention in the instructions that it would be sticky, but by keeping flour down on the counter and on your hands, it rolls out just fine. I’m nervous that yours will be very heavy and floury tasting with that much extra flour in the dough. Keep me posted on how they are. They are not heavy at all. In fact, they are very tender and light. I used the dough hook on my kitchen aid and didn’t knead anything with my hands. So it absolutely needed another 3/4ish about of flour to even get it to manageable roll out stage. It was even still sticky after adding the 3/4 or so extra of flour that I added. I also cut the powdered sugar down by half in the glaze. They turned out delicious with these changes.